Recently a thread appeared that discussed locking gas caps, or more specifically the lack of a solution. 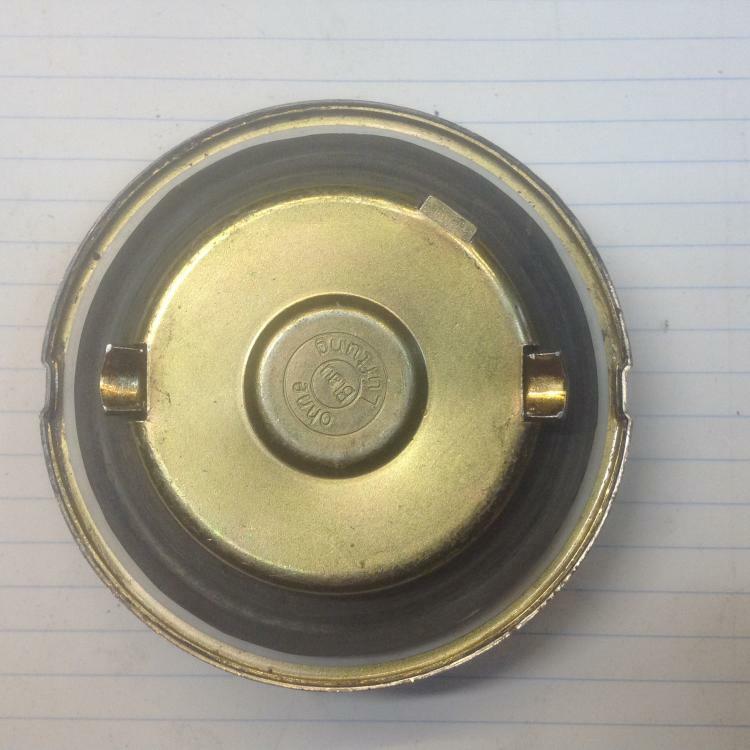 The only known cap (from 70's BMW 2002) fits and appears to lock, but doesn't actually lock to the car. 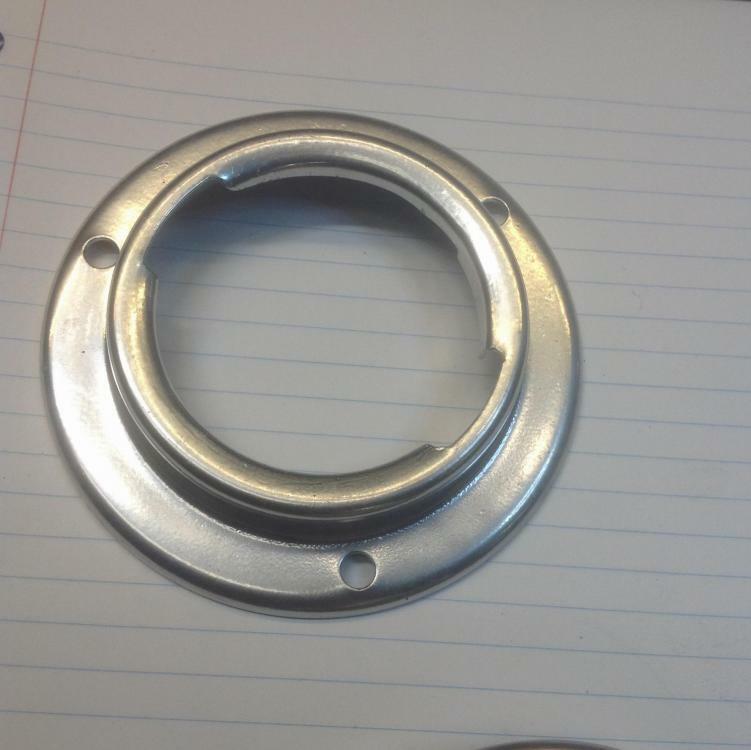 I was able to come up with a solution that modifies the fuel filler ring to allow the locking tab on the BMW cap to have a place to lock against. My locking gas cap solution works for the Z's up to the 74 260. The key is to look and see how many screws hold the filler ring to the body. If it has three screws, the solution is simple. If it has four, then the solution still works but is more difficult to implement. Note this solution does not work on the smaller caps found on 77-78 280's. 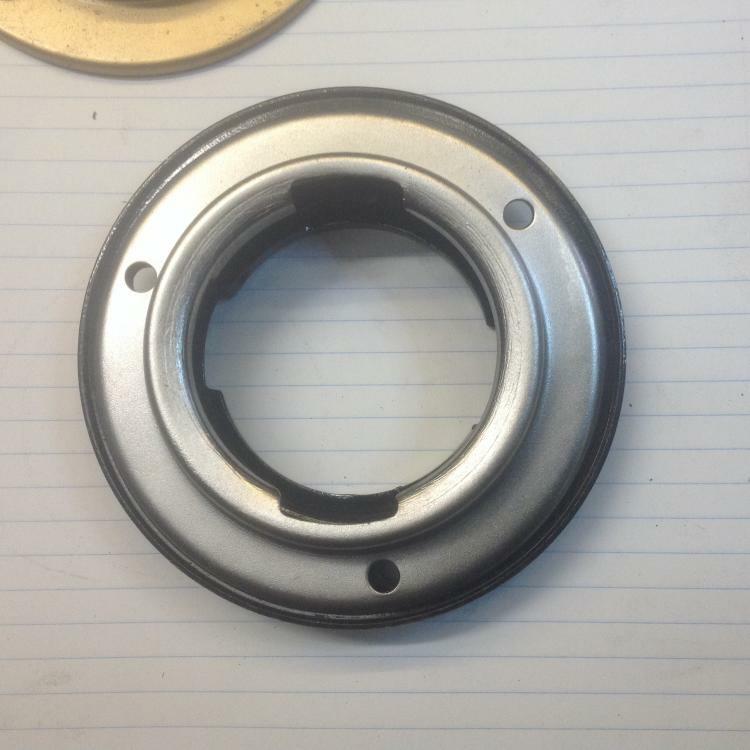 I have a small collection of fuel filler rings that I have modified to work with the BMW locking caps that can offer for sale. I can paint, powder coat or have them CAD plated. I also made a pretty good deal on some of these locking gas caps. This allows me to offer a complete solution at a pretty good price. 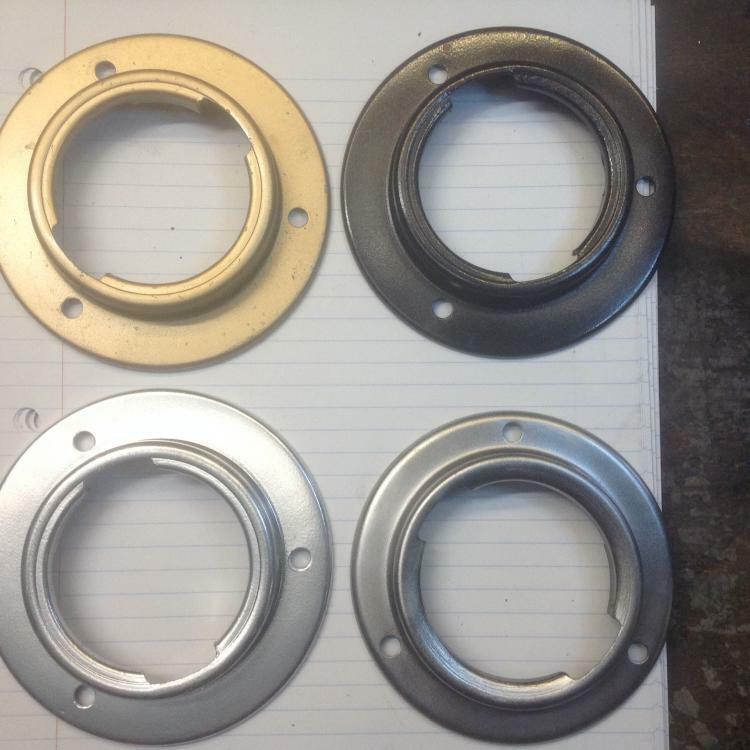 I'm asking $99 USD for a modified powder coated filler neck ring + new locking BMW cap with 2 keys AND a new hand made rubber gas cap protection flap. Shipping is on you. While supplies last. Here is what I am doing so can understand the value of what I'm offering for the $$. 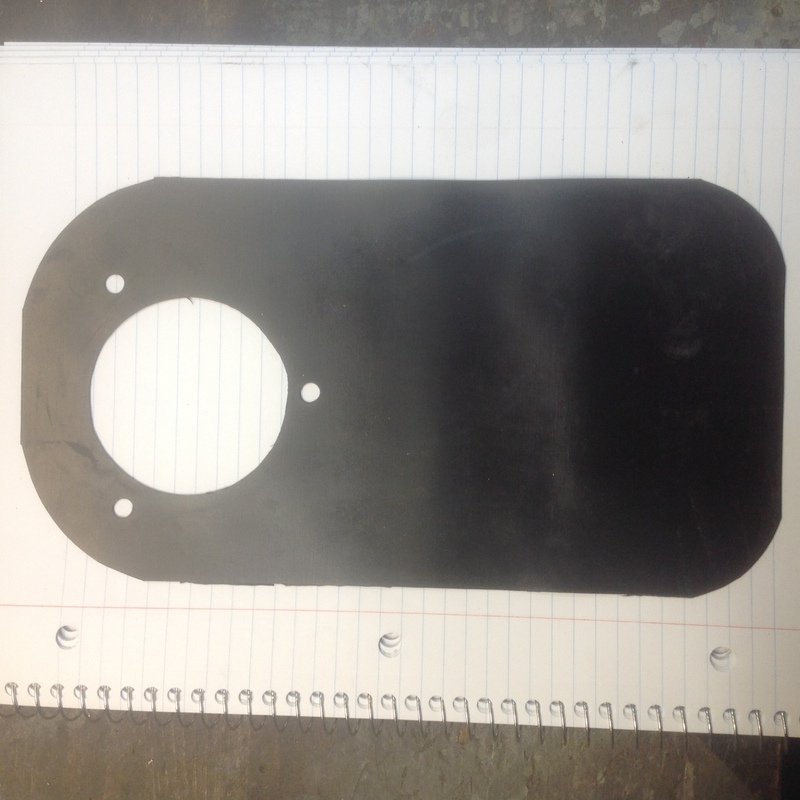 Sandblast the filler ring, weld on the lock stop blob in "just" the right spot. 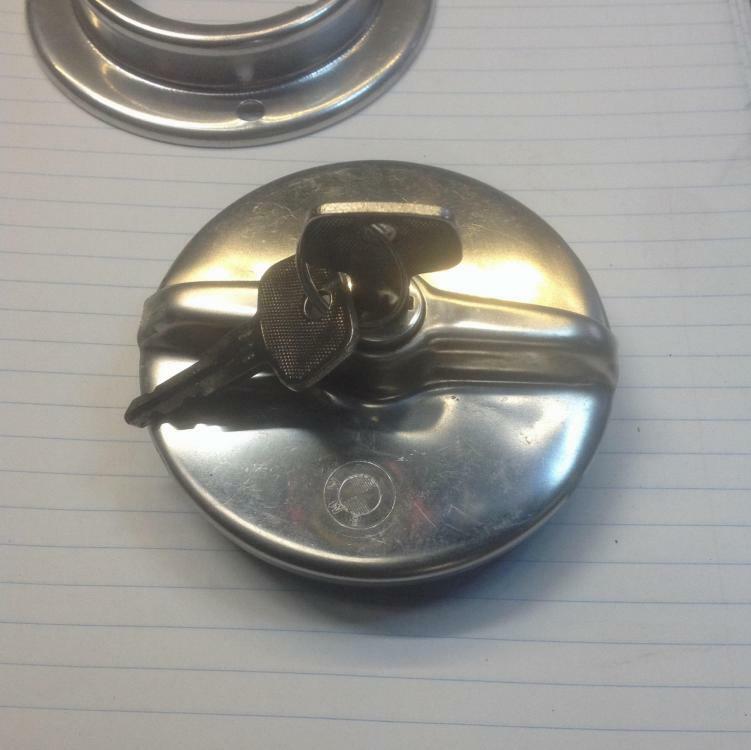 Do a little hammer work around the inside ID to open it slightly so the cap fits better. Powder coat. The new locking caps I just bought need a little shining up to look good, so a quick trip past the buffing wheel. The two locator tabs on these new caps are slightly long and don't fit into our filler ring as is, so grind off a tad of their length and dress them up. Test fit. Slice up a new rubber flap. Package and ship. 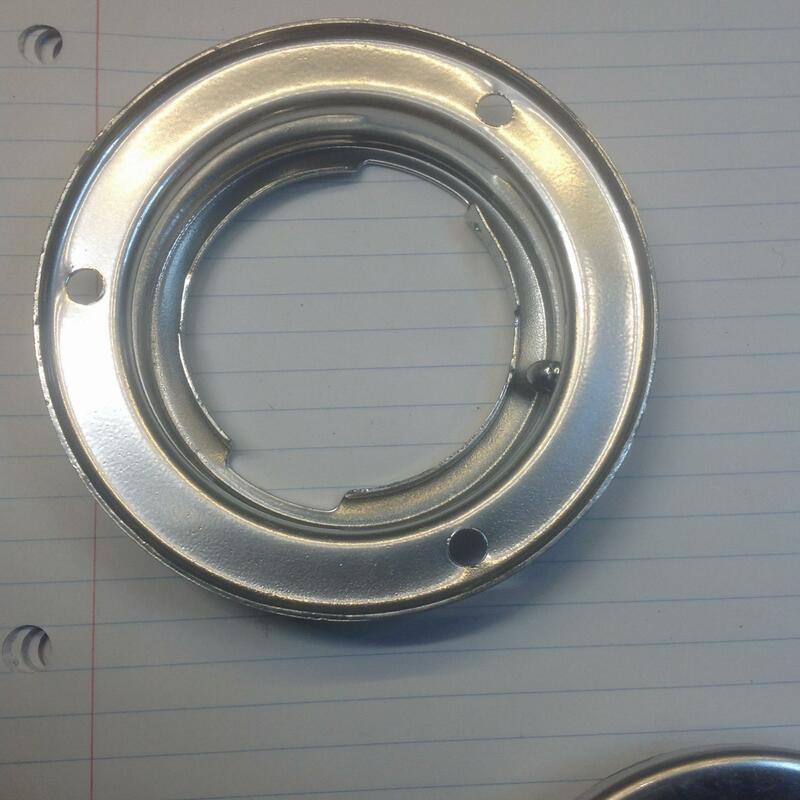 You will have to use the flat rubber sealing ring from your old stock cap in place of the BMW sealing ring. It's too thin. One interesting note. There are two different outer diameters of the filler neck rings. Same bolt circle and same size where the cap fits, just the outer diameter of the mounting flange is different by about 1/8". Early and Late? The caps with the pie crust edge (early non-vented) verses the caps with the angle iron handle (late)? Anybody know for sure? If you care, let me know which one you want. If you have a 280 and have a four screw filler neck, you have to remove the entire neck and its one-piece upper hose tubing (see above pics) to do the "mod" to get the cap to fit. If you want to know what to do, let me know, I'll share a solution to add the "stop" to make the BMW cap work. If you're really desparate send me your neck I'll do it. 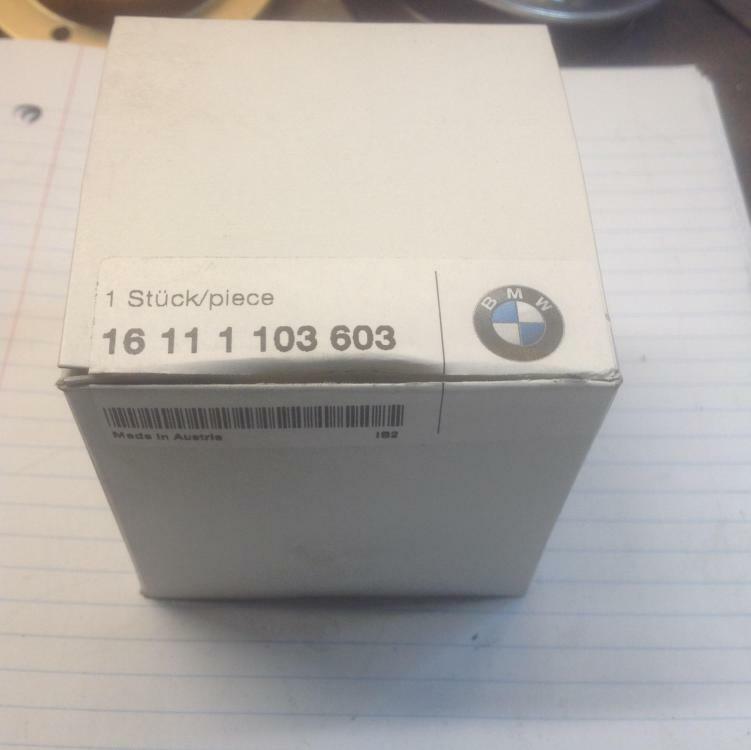 I can supply the BMW locking cap or tell you where to get one. You can contact best by dropping me an email to z240@shaw.ca. Pictures of the items in question follow. This is BMW locking gas cap. Unlocked. Tab at 2 oclock is retracted. Locked. Tab at 2 oclock is extended. The rubber flaps that I can supply. 1/32" thick new rubber. Really? Not a soul? Hello, anybody out there? Is it me? I showered this morning, come on! Don't you people realize the risk you're taking? There are evil people out there right now with bags of sugar or those siphon pumps you can buy for almost nothing at any auto part store just searching for their next victim. You've seen the zombie shows, they're EVERYWHERE. 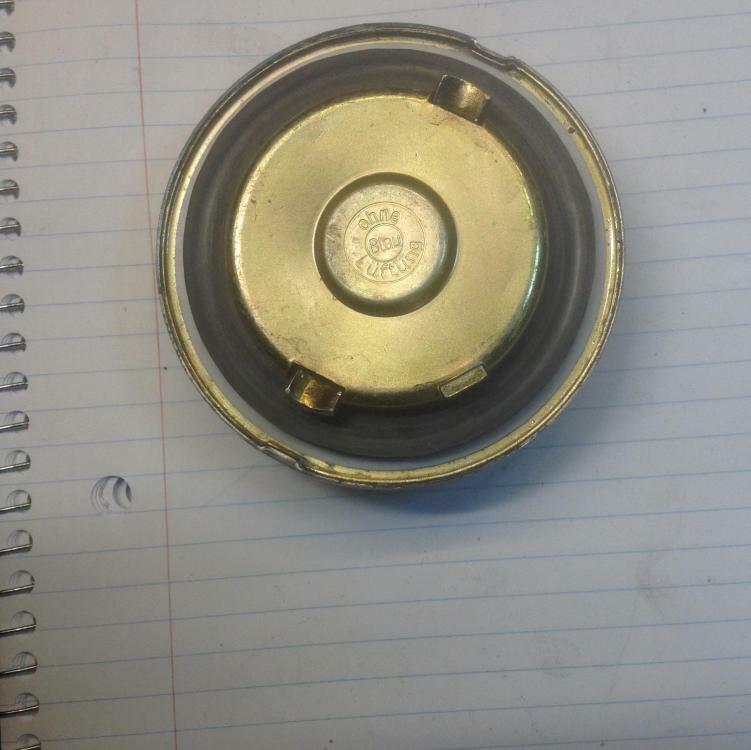 Oh I get it, I showed you where to put the blob and revealed the cap part number, so you are all out there buying your own caps and trying to get some little blobs of solder or JB weld (that $hit fixes anything, right?) to stick to your fuel filler rings. Fine. If you try welding that blob on with the filler ring still on your car, don't blame ME when it all goes KABOOM. Fine then, I'm going to advertise on that FaceBook thing and all of THOSE folks will buy my caps and shiny filler rings. They aren't as smart or mature as you guys. Don't come crying to me when all the cheap ones I bought are gone or BWM finally sells their last one. How many caps do you think they have for the nearly extinct 45 year old cars these fit, anyway? I'd be interested but I don't want to go through the hassle of removing the filler neck. I'd guess that many others are avoiding it also. I even spent time devising a way to add a narrow unleaded filler neck inside my existing filler neck so that I wouldn't have to remove it. Fuel tank work is a major pain. I don't know how I missed this whole thread, must be getting old. Just bought one of these from zKars, it's a simple, elegant solution, thanks Jim. Maybe a short step-by-step explanation of the re-and-re process (photos are nice) would encourage more tire-kickers viewers to become buyers? Maybe Grannyknot can do this as he works through his installation. As discussed yesterday at Z-Fest, this may be more about preventing bad stuff from going into the tank, rather than good stuff coming out of the tank. These are first class. Saw one at ZCON. Maybe North American cars didn't have the lock on the fuel door? ^ No we didn't get the key lock. Not to trash the offering in this thread, but wouldn't the door lock be a better solution and less complicated? 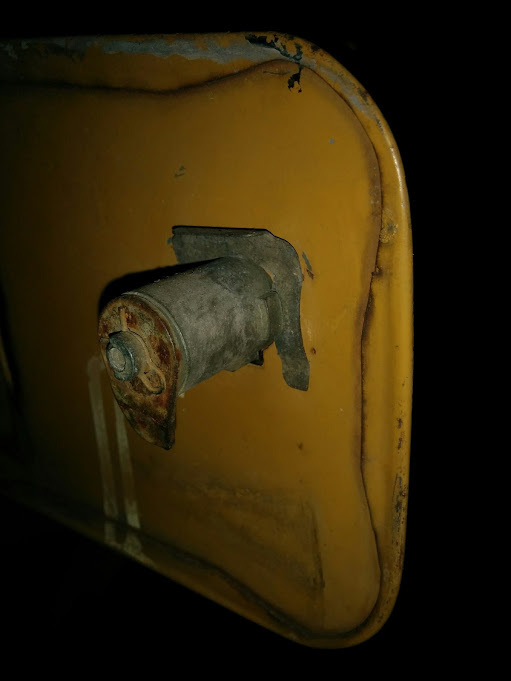 Gav, I believe a door lock is a more complex solution as you would need to drill a hole (71 and later here) in the door and add (weld, drill, fab etc) a loop to the body side where the latch would engage. Also sourcing the keyed latch is a issue here. The early doors with the turn knob had a key lock? News to me. 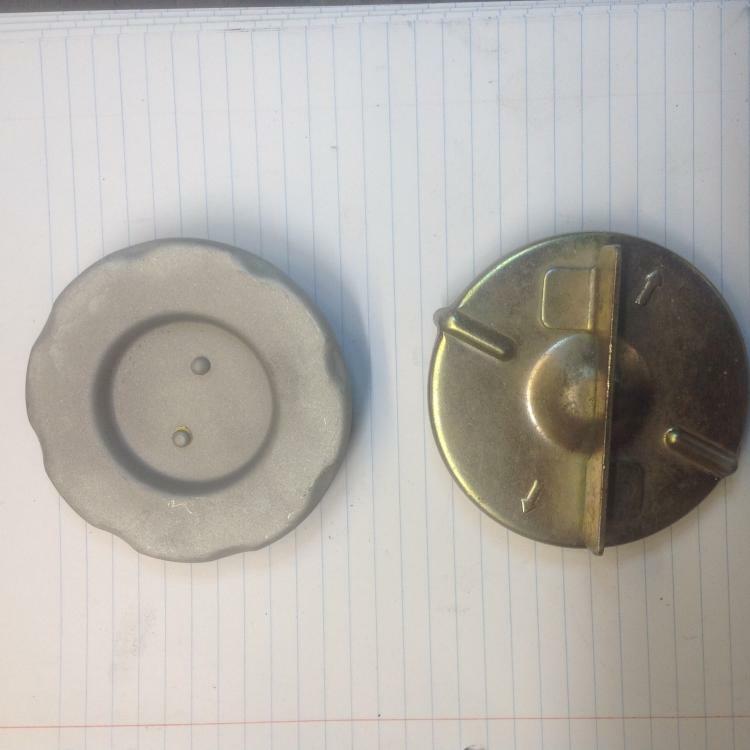 Do you have any extra locking knobs or are they extremely rare. I have an early door with the hole. I always wondered why Datsun didn't include a lock set in the knob. Now that I know they did, I wonder why it wasn't included with the U.S. models. Maybe Australia's image, at the time, influenced their decision. Were there any other countries that you know of that got the locking door? 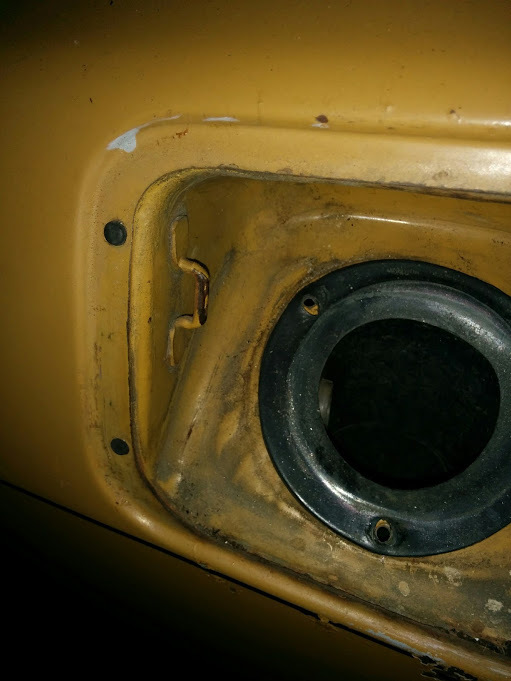 My 1971 Fairlady Z has a locking gas door. USA model? Or are you referring to a real Fairlady. 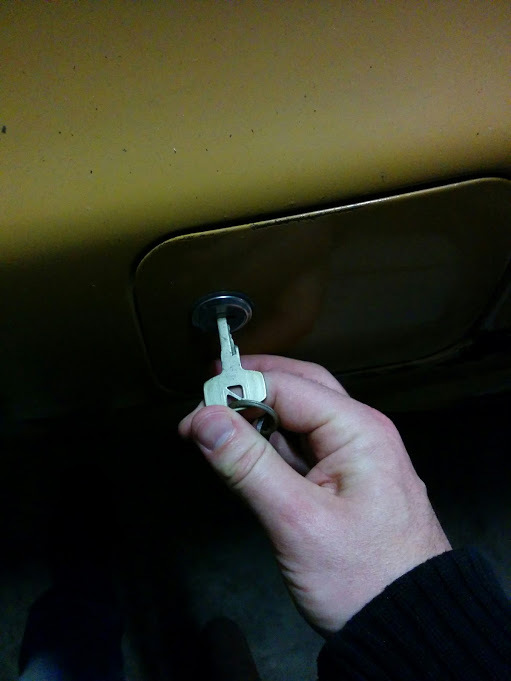 My early 71 has a turn knob but no lock. 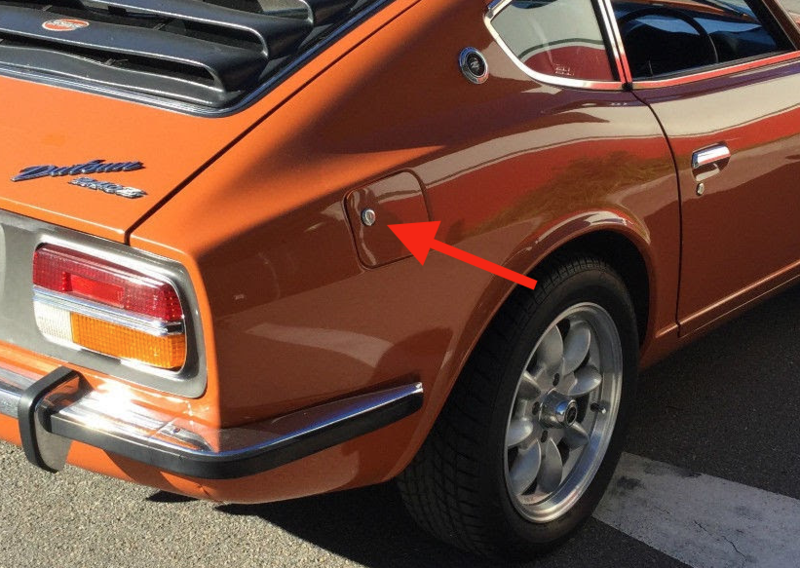 I'm pretty sure the lock was on all S30Z models sold in Australia, so not particularly rare. Although I don't have any spares. 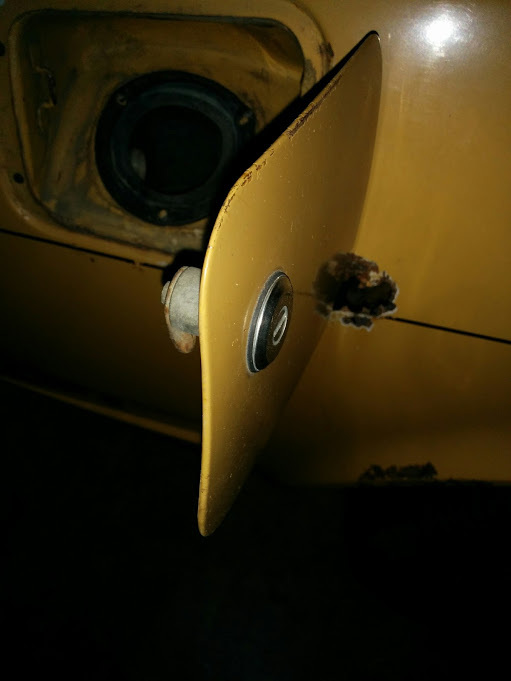 Here are some photos of an early AU delivered 240z I'm restoring. You can see the early style key, the locking mechanism and the bracket it locks with. Nice. It looks like it was keyed to match the doors and the hatch. I like it. Much cleaner look than the protruding twist knob. Is everything the same on the body and the door the same as US models except the lockset? I assume so, but have never seen the US fuel door (or taken much notice of the differences). That's why I took those photos so you could compare. That gas hatch door look looks exactly like a door lock cylinder. Only thing unique is the bracket on the end that engages the bracket on the body. Should be dead easy to duplicate that. So does anyone have a door lock cylinder laying around and an early gas door to see if it fits without reworking the door? 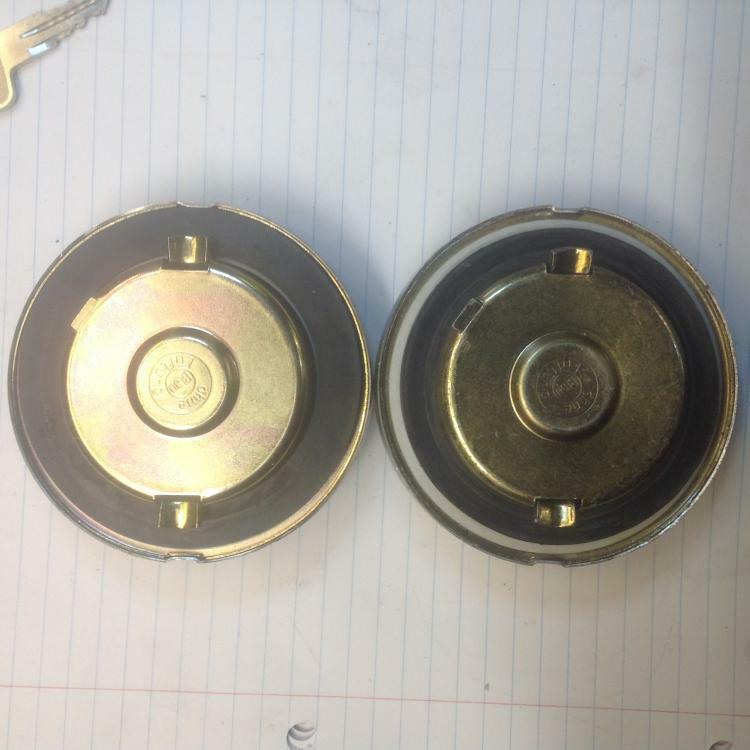 I don't have door locks to look at BUT the hatch lockset EXCLUDING the removable offset tab from a late 71 is the same length as the early 71 turn knob INCLUDING the offset tab. Conclusion, a fabricated straight tab on the hatch lockset (Easy Peasy IMO) would work with the original wire catch on the body. A bit of blacksmithing on the ends of the appropriate ga. wire for the catch (perhaps a pc. of welding rod) a couple of holes and screws or pop rivets to hold the catch in place would be easy on later Zs. 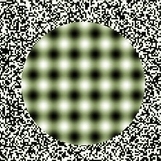 The only problem on later Zs is the lack of a hole. 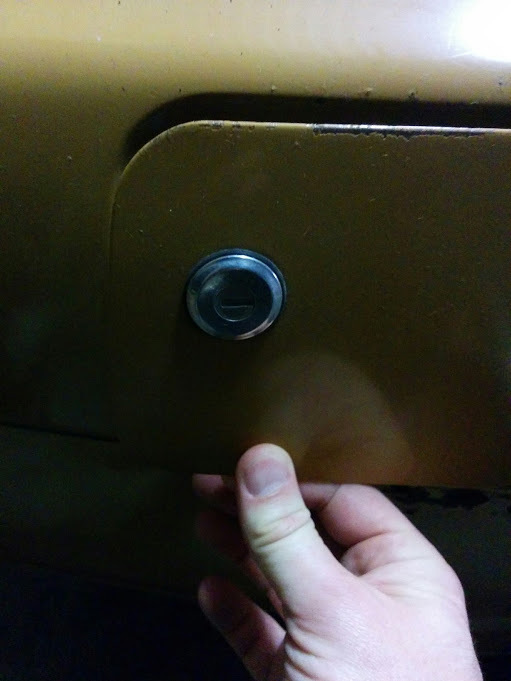 This "easy peasy" mod is based on the assumption that the diameter of the hatch lockset is the same or smaller than the orig. 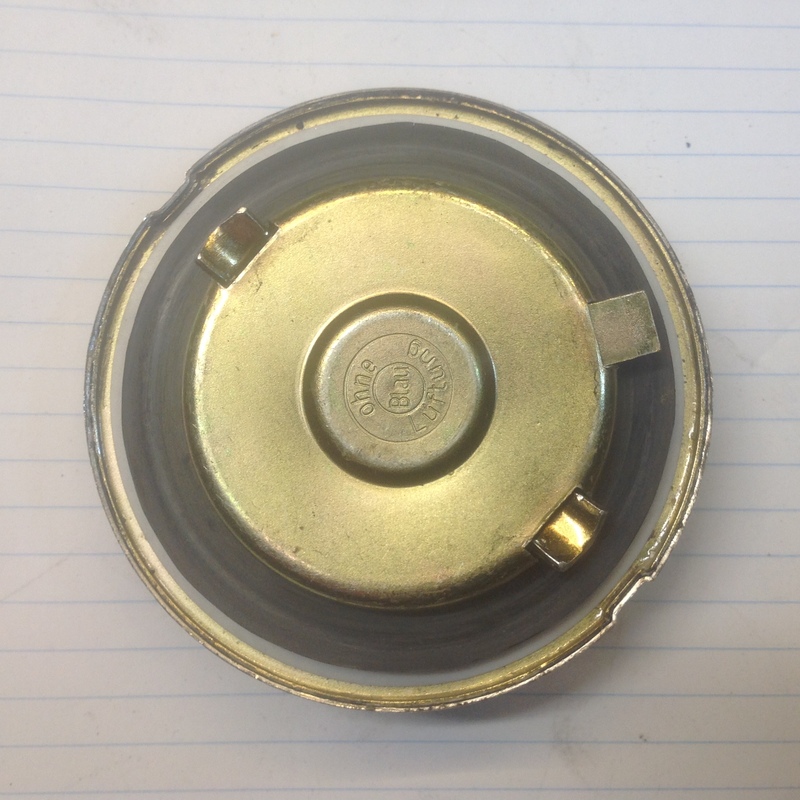 gas lockset and won't interfere with the cap. 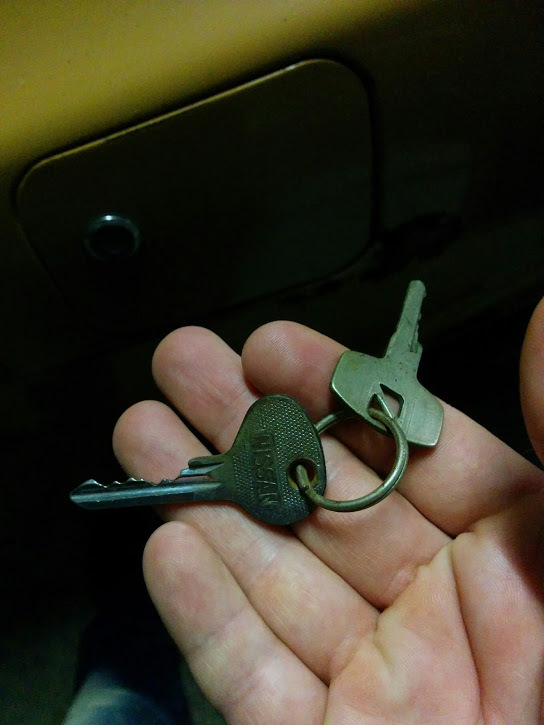 I think the locksets were all the same diameter.